"Make up your own story - it's more fun that way." He looked at the picture. Humans worshipped a vast variety of weird looking deities. This he knew. He was told that the current favourite was a bearded guy tortured and left to die upon a cross. Crowned with a wreath of thorns, eyes closed in prayer, face contorted in pain, skin flayed by whipping, limbs nailed to the wood, side pierced by a spear, legs broken and dying slowly, surrounded by mourning friends and family. Completely unlike this picture. This here, was a picture of domestic bliss. It showed a family of four - Dad, Mum, Big brother and Little brother. They appeared to be forest-dwelling tribals, standing in a clearing on the banks of a river surrounded by a menagerie of animals, the stars and the mountains looking over them. Dad was clad in tiger skins, Mum in a simple sari (sans blouse and petticoat, which was apparently the tribal style), Big brother wore a dhoti and Little brother was a naked toddler clinging to his mum. Little brother was the most recognizable, with the body of a chubby toddler and the head of a three-eyed elephant. Hardly surprising, since mum and dad also had three eyes each. This was obviously Ganesh, heart-throb of millions, pictured here amusing himself with a lasso. Big brother was a proud-looking, strapping young lad, dark-skinned like his mother, and bearing a spear. He didn't have three eyes, but had six heads that presumably served him just as well. And Dad, Dad was the picture of contentment. At first blush he looked like a hippie/caveman, with his long brown hair in dreadlocks, three eyes half closed in semi-consciousness, snakes coiled at his throat and wrists, the head of an axe peeking over his right shoulder, chest covered in a necklace of human skulls and his body smeared with ashes. But a second look revealed hidden depths, for he had one arm on the shoulder of his firstborn, and another around his wife's waist, and the gleam in his barely visible eyes and his wry smile seemed to speak volumes about his true nature. 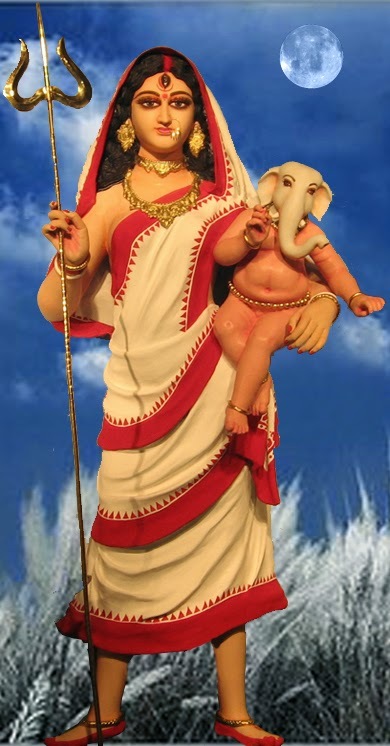 Mum and baby Ganesh, the Santhali version.